Discover Bolzano, Lake Garda, Verona and Venice, all in one tour! This tour will offer you the chance to visit the Dolomite mountains around Bolzano, the beauty of lake Garda and cities full of culture and history like Verona, Vicenza and Padova; and last but not least, the fascinating city of Venice. 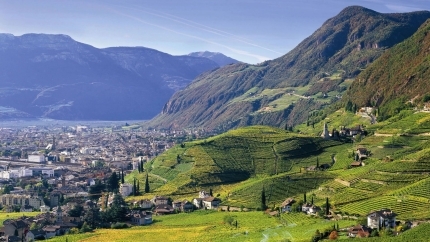 You will discover the rich landscape as you ride through South Tyrol's vineyards and along the Àdige to Trentino. You visit Lago di Garda on your way to Veneto and the Po Valley. Famous cities such as Verona, Vicenza and Venice are either your ultimate destinations or located on the way. These are the perfect ingredients to make this an extremely remarkable bike tour. You will take a boat journey on Lago di Garda and have a chance to have a refreshing swim, and the thermal springs of Abano will soak your weary muscles. There are light hilly bits with short uphill sections.